The Mountain Leader Award (ML) was established to promote the safe enjoyment of the hills and mountains in the UK. 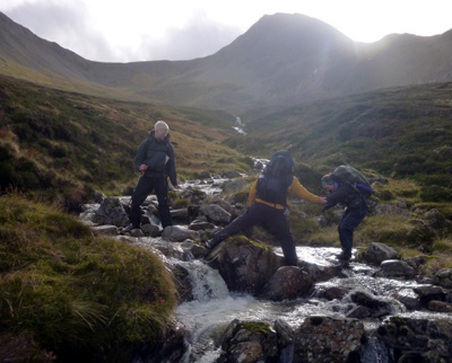 The scheme provides training and assessment in the technical and group management skills required by those who wish to lead groups in the mountains, hills and moorlands of the United Kingdom and Ireland, other than in winter conditions. It integrates experience, training, and assessment in a variety of testing conditions in mountainous country. Our scheduled ML courses are based in Fort William but if you would like a course based somewhere else please get in touch. The prices given below are for the course only including specialised equipment, transport on the course and lecture facilities. Accommodation and meals are not included in the prices. The training courses are £375 per person for the six day course. ​To check if you have the pre-requirements please look at the Mountain Training website. To make a booking on this course please contact us to check our availability before completing a booking form. The assessment courses are £385 per person for the five day course. ​To make a booking on this course please contact us to check our availability before completing a booking form. Reassessments can be arranged on a date to suit you. Contact us to check our availability and discuss your reassessment requirements. Scheme Briefing and setting up of the course. Discussion on "Responsibilities of a Party Leader". Late morning onward is spent outside looking at core navigation skills. Evening presentation on Mountain Weather. Leadership styles, group management and security on steep ground. Evening session on ropes and knots. Unplanned and emergency use of the rope on steep ground. Evening discussion on "Between Training and Assessment". Managing mountain incidents including emergencies, injury, self rescue, water hazards and river crossings, mountain rescue services and route planning. Evening preparation for expedition. Start of overnight expedition including navigation practice in the dark. Afternoon return from expedition and clean up. Individual debriefs and close of course by 5pm. Scheme Briefing and setting up of the course. Assessment of core navigation skills, environmental awareness, knowledge of equipment and what should be carried, management of incidents and accidents. Evening discussion of home paper. Leadership styles, group management and security on steep ground, with and without a rope. Evening session on route planning and preparation for expedition. Start of three day expedition focusing on navigation, leadership skills and wild camping.